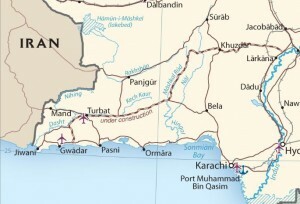 Detail of CIA Pakistan transportation map showing region around Gwadar. Click on map for a larger image. Does Rohrabacher want to help the Baloch, or does he merely want US control of the port of Gwadar and an end to the planned gas pipeline from Iran to Pakistan through Balochistan? China took control of Pakistan’s Gwadar port on Monday as part of its drive to secure energy and maritime routes that also gives it a potential Arabian Sea naval base, sparking Indian concern. “The contract of operation of Gwadar port is formally given to China. Today, the agreement is transferred from the Port of Singapore Authority to China Overseas Ports Holding Company Limited,” President Asif Ali Zardari announced. “The award of this contract opens new opportunities for our people… It gives new impetus to Pakistan-China relations,” added Zardari in a speech broadcast live on television. China paid about 75 per cent of the initial $250 million used to build the port but in 2007 PSA International won a 40-year operating lease. Then-ruler Pervez Musharraf was reportedly unwilling to upset Washington by giving control of the port to the Chinese. Iran’s Navy Commander Rear Admiral Habibollah Sayyari says the country is establishing a new base in the Sea of Oman near Pakistan’s border to boost the Islamic Republic’s defense capabilities. “The naval base, which is under construction, is situated in the Gwatr Gulf on our country’s farthest eastern shores bordering Pakistan,” Sayyari said on Sunday. “The Iranian navy has so far had no military presence in the area, but now, we will be present in the region to defend the interests and maritime resources of our country and exercise a tighter control over the traffic in the region,” Sayyari noted. Just as he took up arms to fight alongside Osama bin Laden’s Mujahideen movement against his arch-enemies from the Soviet Union, maybe Rohrabacher will decide to team up with Iran’s navy near Gwadar in an attempt to punish Pakistan for daring to thwart his wishes. In going back to read the first post in my series on Rohrabacher (which is the first link in this post) earlier today, I was reminded once again of the value of long-time commenter and friend Bob Schacht. He was very fast in the comments on that post to point out the significance of the Port of Gwadar, the Iran-Pakistan gas pipeline and the role of China. His focus on those issues has been very important in following subsequent developments. For those who missed the news, we lost Bob not too long ago. How I would to have his informed take on today’s developments. U.S. sponsored terrorism in Balochistan http://landdestroyer.blogspot.com/2013/02/us-saudi-funded-terrorists-sowing-chaos.html is about keeping out China and Iranian pipelines. I’ll note with a chuckle that MEK went from State Dept terrorist list to viable alternative govt in Iran in 4 months. From the annals of they’re not even bothering to hide it anymore. Not sure if this is going to throw the PNAC off track or help them along, either way it looks like bad brewing. A pipeline through Afghanistan is now irrelevant and less cost-effective than it was in 2001. Hope that pipe dream of US neo-cons now dies. The idiots can’t look at a topographical map and see the cost issue. I suspect you could have ended that last sentence after the word ‘map’. I must admit, Pakistan is playing real smart over here. Sometimes, I feel that it all boils down to Pakistan vs India in every game that happens in the Asian continent. @TarheelDem: Think that isn’t entirely accurate. Where pipelines will run to get Caspian region oil & gas to consuming countries still undecided according to what I’ve read. Two alt routes running east thru Russian sphere of influence, or West sphere of influence are the ones most mentioned, but Afghan not out of the running yet. O&G corps are not one-to-one with USG. They get a say too in complicated global power plays. Unical did dally with Taliban in rivalry with Bridas to make one think the game is more complex than cost or USG decisions. Also Afghanistan is the soft Islamic underbelly of Russia & near enough to Xinjiang (Uighurs) province in China for U.S. to foment Islamist uprisings. It’s not all about Pipelinestan. Unsettling & encircling & frustrating Russia & China might be more impt. @Wendy: Again more complicated than that. Both India & Pak are thinking about joining Shanghai Cooperation Organisation. That would drive U.S. nuts.